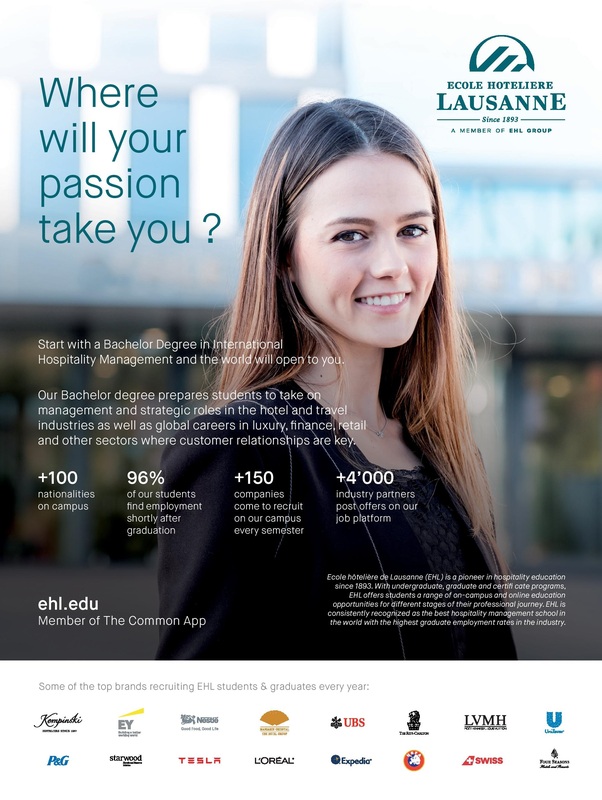 Ecole hôtelière de Lausanne offers a wide range of programs for students and industry professionals. Whether you want to gain more expertise before launching your career, or climb even higher within your company, we have a program for you. EHL boasts the highest graduate employment rate in hospitality education. the hotel and travel industries as well as global careers in luxury, finance, retail, and all other sectors where customer relationship is key. The Bachelor degree is a 4 year program including a full semester of applied learning and 2 internships. Our international master’s program is a 16-month full-time curriculum that combines theory and practice, giving you a holistic perspective on the hospitality business. Seminars bring you important insights from the front lines, immersion periods let you explore new professional and personal horizons, and a hands-on business project offers a chance to apply your knowledge. Study in three cities on three continents: Lausanne (Switzerland), Hong Kong, and Houston (USA). As a Student in our full-time, on-campus Executive MBA in Hospitality Administration (EMBA) program, you’ll gain the solid financial and management skills you need to be a leader in any hospitality-related business. The EMBA comprises seven modules over one academic year of accelerated study. OurMBA in Hospitality is designed for working professionals. 80% of the program is taught online, so you can study anytime, anywhere, without leaving your job. The face-to-face sessions allow you to meet your peers and industry experts. Based on the latest developments in the world of hospitality, the program combines contemporary theories with practical strategies that you can apply immediately at work. “EHL students have just the sort of team spirit and professionalism that we like.” Price Waterhouse Coopers.